Aiea Loop trail: a 7.7 km circuit overlooking Pearl Harbor and half of Oahu. 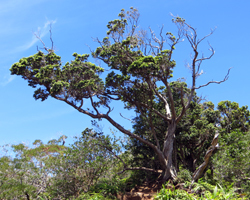 Aiea Loop Trail: an Introduction to Hawaii hiking. I first hiked the Aiea Loop trail 30-ish years ago on a rainy day. Yeah… that was a mistake. It was a 7.7 km mud bog that has us slipping, sliding, and falling for the entire length of the trail. After that, I never felt compelled to go back there again. Been there. Done that. Good enough. 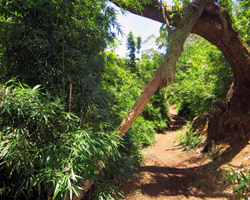 Nowadays this trail is called by the misleading PC name of Keaiwa Heiau Loop trail (even though the trail leads away from the heiau rather than toward it). 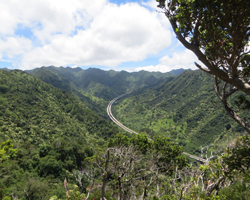 But then I created this web site; so I needed to go back to the Aiea Loop trail for a fresh perspective and some fresh pictures to show you. I went on an absolutely gorgeous day in July (the kind of day that I would rather be hiking Puu Maelieli), and I’m happy to report that the whole thing wasn’t a mud bog – only about 1 km of it was a muddy mess. The rest was okay. Even so, this still just isn’t my favorite Hawaii hike. If this was a muddy trail leading to a waterfall, that would be one thing. I’d say put on your boro boroz (old, worn-out clothes) and go have fun. But this trail goes nowhere. It’s just a circle. I can get mud elsewhere without the sense of futility. It’s a relatively easy hike with gradual slopes. It’s well shaded throughout significant portions of the trail, which keeps it cool. It’s a good trail for kids who can walk more than 7 km (approximately ages 9 and up). Views include everything from Schofield Barracks in Wahiawa (the middle of the island) to Pearl Harbor to Halawa Valley (H3 freeway), Tripler Army Medical Center, and even Diamond Head. 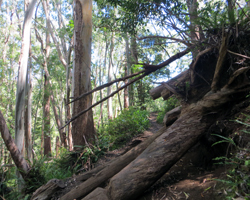 The Aiea Loop trail passes through a fantastic mountain forest with groves of giant eucalyptus, strawberry guava, paperbark, bamboo, and Cook Island pines, ironwood, Hawaiian koa and ohia. There is a crashed World War II B-24 bomber along the trail. There’s a halfway decent chance you’ll see a family of wild pigs. There are restrooms, water fountains, and picnic areas. The park is well-maintained and attractive. 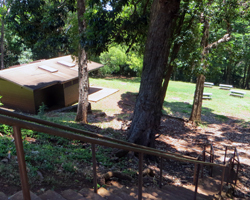 The entrance to the park (before you get to the trail) features a fully-restored ancient Hawaiian heiau (temple) that is definitely worth seeing. It’s a relatively long hike with a few steep slopes. It’s well shaded in many spots, which means some muddy parts of the trail practically never dry. It’s too long for most kids younger than about age 9; and it’s kind of boring for kids who like looking at things other than endless trees. 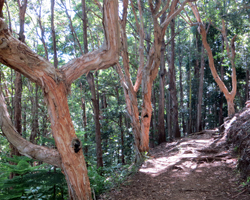 The scenic vistas are limited to a very few number of spots along the Aiea Loop trail, and the tall forest trees prevent almost all panoramic views. Ironically, the very best view is of the H3 freeway (which didn’t even exist the first time I hiked this trail). 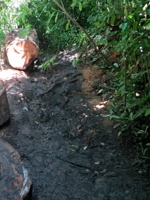 The trail passes through what is basically a rainforest, so it’s perpetually wet and muddy. The area where the plane crashed is so overgrown that I could no longer see the wreckage. There’s a halfway decent chance a family of wild pigs will see you. The trail itself is not particularly well-maintained. 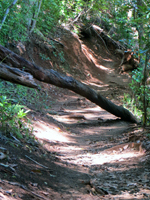 There were at least 10 fallen trees creating various obstacles across the trail. It truly is a beautiful forest. And the pigs seem to be very tame, because I’ve seen them up on the road next to people and cars. But to me, the plane crash is one of the most interesting aspects of this trail, so I was very disappointed that I could no longer find it. If you can’t find it either, there’s a plaque near the upper trailhead that will tell you the basics about this fateful flight. Wait until a dry day after several consecutive dry days. Unless you really enjoy slogging through the mud, you’ll thank me for this one. If you choose to go in less optimal conditions, bring lots of old towels, a change of clothes and some plastic bags for your shoes/clothes (unless you just decide to throw them away at the end). Even though it’s shady and cool, that’s not an excuse to neglect using sunscreen and carrying plenty of water. You’ll still get enough sun exposure to burn; and you’ll still get dehydrated. Be smart and be prepared. At a leisurely pace, this trail can take 2.5 to 3 hours to hike the full length. If you’re hoping to see the WWII plane crash, I wish you luck. So was I. I went back and forth along the section of trail from which it is supposed to be visible three times looking for a marker sign and/or for a glimpse of the wreckage. It's located a short way down the trail from the H3 tunnel overlook, on the east arm of the loop, down in the gulch on the west side of the trail. Unfortunately, that describes a nearly-two-kilometer stretch of the Aiea Loop trail. And it’s impossible to explain it any better than that: just look for the trees… it’s near the trees. Like that will help. I wanted to geo-tag my photos so I could just give you GPS coordinates, but that didn’t work out for me. So all I can say for sure is that the wreck was a lot easier to see 30-some years ago. Sorry. The muddiest part of the trail is the last half-kilometer (if you start at the upper trailhead). So if you start at the end, you get through the worst part first; and then you’re free to enjoy the rest of the trail. On a dry day like the one I chose, that can make a huge difference. By the time I got back to my car, my shoes were dry and free of mud. It would have been the exact opposite had I started at the upper trailhead. That muddy section I just talked about… it will be going downhill if you start at the lower trailhead. Otherwise, you’ll have a muddy uphill climb – saving the worst for the last! You have to walk a short but steep section of the paved road from whichever end of the trail back to your car. If you start at the lower trailhead, this steep section of road that follows your 7.7 km hike will all be downhill. But if you start at the upper trailhead, you’ll be walking up (immediately after your uphill slog through the mud). Stay safe and have fun. You probably won’t cross paths with me out there, though… at least not for another 30-ish years or so. I’m going to go do a waterfall hike (sorry, the waterfall is on private land, so it will have to remain a secret for locals only)!